Taking notes with mind maps is efficient and convenient in recording important information. Here are four practices of using mind maps for note taking. Note taking happens anytime and anywhere for anyone. No matter what your identity is, you need to take notes at work, at school or at home. These notes include taking meeting minutes, recording main ideas of a text, making a shopping list, taking phone messages, making a to-do-list, and reminding ourselves of things to do etc. A person has to deal with massive information, so learning to take good and useful notes is an essential skill. Finding a great solution - mind mapping, to note taking matters a lot to saving time and improving efficiency. This page offers 4 best practices of using mind maps for note taking. Comparing with traditional meeting minutes taken on notebooks in a linear structure, mind mapping meeting arrangement and meeting minutes is easier to catch the point. Taking meeting minutes with mind map software in a PC requires no handwriting and erasing, and it is more convenient and time-saving. Besides, a mind map develops in a radiant structure which is exactly the way human brain works naturally, thus aid quick memorizing. 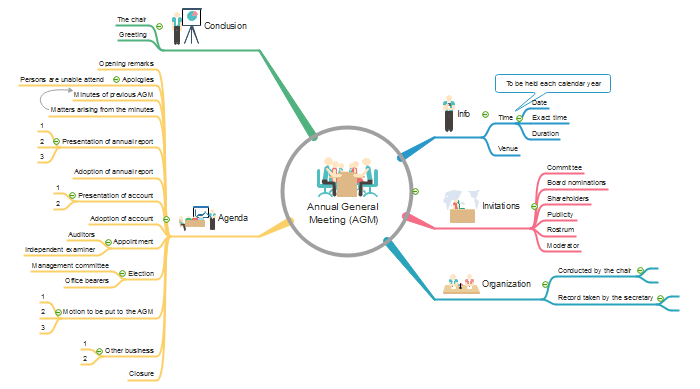 Before the meeting, prepare organizational content such as place, date and attendees and overview before the meeting to get familiar with existing materials; form a reasonable layout of the meeting in mind maps software in advance. During the meeting, type statements of each speaker in their prototype as possible as you can, list keywords appeared and record solutions and following tasks. After the meeting,summarize the information with keywords or short phrases and reorganize the relations between keywords appeared and adjust the mind map notes to business style. All the information mentioned above are important and can to be captured and recorded in mind map software for future reference. During days at the university, mind maps played an essential role in my study in two ways - taking notes during lectures and studying and review before exams. Lectures often last longer than classes and illustrating things deeper and further in a divergent flow, involving almost no interactions, like the way a mind map develops. Mind mapping lecture notes won’t take much time and helps concentrate on the lecturer rather than your notes. In addition, linear texts taken in urgency often get you lost because they are usually written mixed and disorderly. In this case, as an audience, you need to write down information important to you and points you don’t understand as floating topics separated from other topics. After sorting out the important information and difficult points, re-illustrate them in concise expressions and images. Then rearrange the map and share or save it. 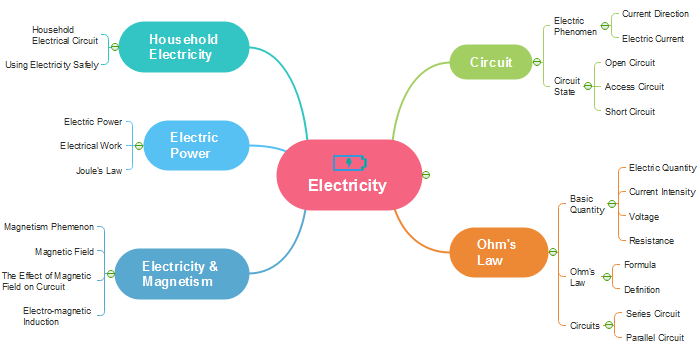 When studying in class, since computers are not allowed in the classroom, I would use mind map as a study tool and map my notes with A4 paper. Most teachers won't teach the whole chapter in a 45-minute class. Instead, they supplement a certain subject with detailed points from time to time. If the notes are taken in linear texts, students have to squeeze the supplements into corner and margin of a note page with lines and arrows, making the notes look messy. The next time you need to use certain part of the notes, you may find it nowhere. When preparing for exams, I would gather all the mind maps of my notes and collect all the main concepts in a new map to understand in a whole picture with less detailed information. This allowed me to really grasp the material without knowing the minor details. Books are the source of knowledge. Human beings have started reading since thousands of years ago. Summarizing the content of a book is as important as the process of reading. It’s through a book summary that you can retell the story, understand the relationship and digest the ideas. It’s oppressive to talk about a book without a line on time or plots. 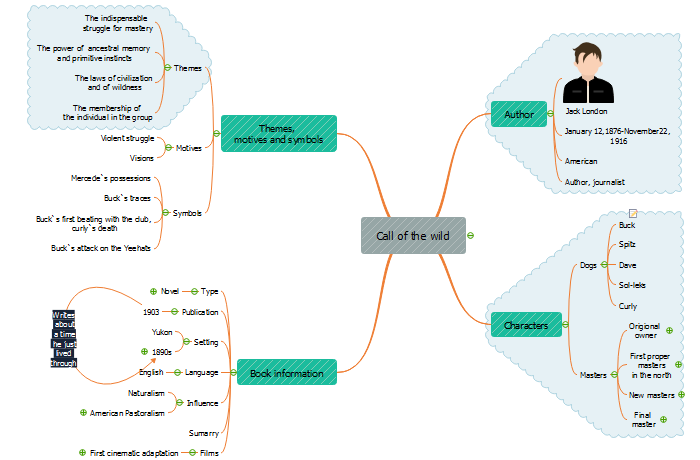 A book summary in the form of a mind map can display core ideas, characters, plots,background, time, place reasons, and results clearly at a glance. A mind map forces students to extract key information from lengthy book texts with key words and short phrases to understand and memorize the content of a book better. Mind maps are perfect for summarizing information carried in books. Center the book name on the canvas as the central topic. In non-fiction books, a lot of core ideas and definitions are listed to explain concepts. With branches as main concepts illustrated, you can enrich concepts and ideas with scattered notes, comments or attachments and structure theme for easy comprehension. In addition, taking book notes on mind maps alleviates your burden of leaving messy hand-written lines and texts distributed irregularly over pages of a book. Brainstorming is a way of making a group of people all spontaneously think about something at the same time, often in order to solve a problem or to create good ideas. Nowadays, brainstorming is widely introduced into classes to stimulate students’ creativity and imagination. Mind maps can be a great tool used during and after the brainstorming. The process of brainstorming usually involves capturing massive ideas and some of them even sound ridiculous. During the brainstorming, you need to record all the ideas that pop up around a certain theme for future reference. Brainstorming always comes with fast discussion and fierce argument. In this case, you won't have much time recording ideas flash by with writing them down literally. 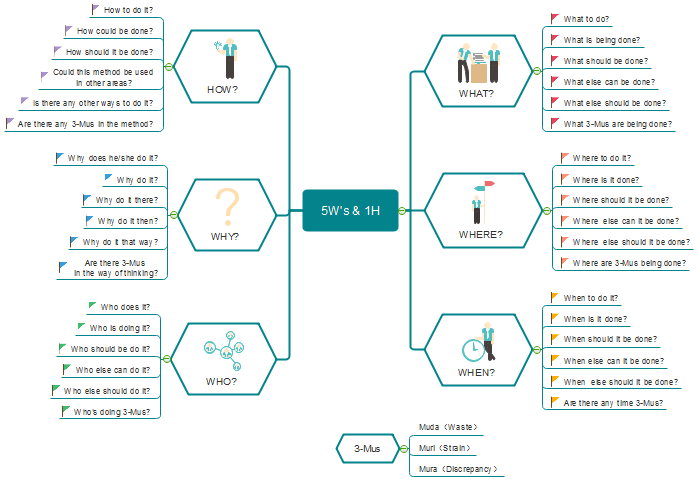 Mapping the ideas into a mind map allows you to easily capture all the things that are put out and you can easily later on structure the ideas into something more meaningful. A mind map develops exactly in accordance with the way human brain works naturally. When you check the ideas given out in a mind map, you’ll find it much easier to figure out the key points than picking up useful information from messy linear notes taken in a hurry. The next time a brainstorming comes, you may try mind mapping. Taking notes with mind maps helps you to focus as it makes you active rather than passive and keeps you involved in learning. Give Edraw Mind Master free mind map software a try and you’ll find it extraordinary in note taking. 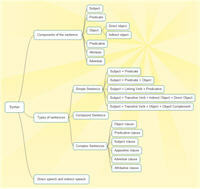 The following are built-in mind map templates designed on a vector basis from Edraw mind map software. 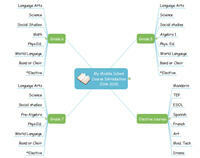 This software also covers mind map templates in other fileds such as business and daily life. 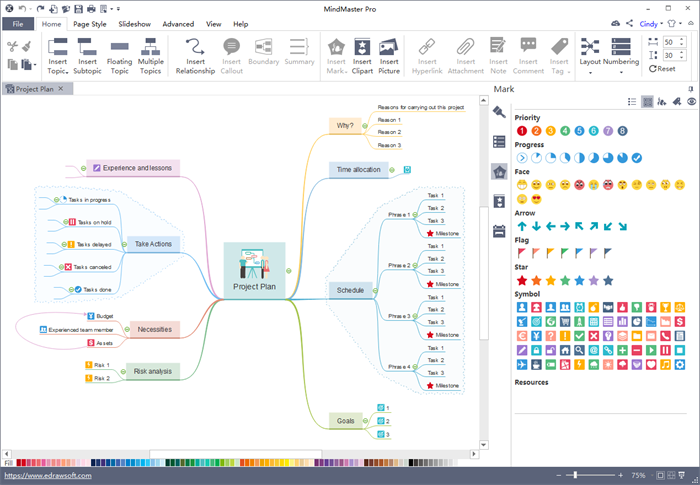 MindMaster - Excellent Cross-platform Mind Map Software for Free!